In Norse Mythology, Thor (Old Norse: Þórr) was a widely worshipped deity among the Viking peoples and revered as the "God of Thunder." Historical evidence suggests that Thor was once understood as the "high god" of the Nordic pantheon, only to be displaced (in rather late pagan mythography) by the All-Father, Odin. Thor was the focus of numerous Norse folk tales and he was seen to be representative of the Viking lifestyle, perhaps due to his associations with physical prowess and straightforward (though at times vicious) conduct. In the vast majority of extant mythological sources, Thor is described as the son of Odin and Jord (a giantess). His popularity is evidenced by the frequency of tales centering around his heroic exploits, where he indulges in raids and contests of wills with the giants (Jotun) and where he is also seen favorably in accounts of Ragnarök (the great battle at the end of time), where Thor and Jörmungandr (the Midgard serpent) will kill each other. The influence of Thor still echoes in the English, German, Dutch and Scandinavian languages today. For example, the word "Thursday" in English derives from "Thor's Day." The equivalent in German (Donnerstag, meaning "Thunder's Day") was also named after Thor. As a Norse deity, Thor belongs to a complex religious, mythological and cosmological belief system shared by the Scandinavian and Germanic peoples. This mythological tradition, of which the Scandinavian (and particularly Icelandic) sub-groups are best preserved, developed in the period from the first manifestations of religious and material culture in approximately 1000 B.C.E. until the Christianization of the area, a process that occurred primarily from 900-1200 C.E. The tales recorded within this mythological corpus tend to exemplify a unified cultural focus on physical prowess and military might. Within this framework, Norse cosmology postulates three separate "clans" of deities: the Aesir, the Vanir, and the Jotun. The distinction between Aesir and Vanir is relative, for the two are said to have made peace, exchanged hostages, intermarried and reigned together after a prolonged war. In fact, the most major divergence between the two groups is in their respective areas of influence, with the Aesir representing war and conquest, and the Vanir representing exploration, fertility and wealth. More specifically, Georges Dumézil, one of the foremost authorities on the Norse tradition and a noted comparativist, argues quite persuasively that the Aesir / Vanir distinction is a component of a larger triadic division (between ruler gods, warrior gods, and gods of agriculture and commerce) that is echoed among the Indo-European cosmologies (from Vedic India, through Rome and into the Germanic North). Further, he notes that this distinction conforms to patterns of social organization found in all of these societies. The Jotun, on the other hand, are seen as a generally malefic (though wise) race of giants who represented the primary adversaries of the Aesir and Vanir. Thor is one of the most prominent of the Aesir, functioning as the primary god of warriors and battle. Given the importance of such militancy in Nordic society, the prominence of Thor (in the surviving mythic corpus) is hardly surprising. Thor features strongly in the Prose Edda of Snorri Sturluson (a twelfth-century Icelandic historian), in which his many conflicts with the race of giants (the Jotun) are a main source of plots. In these tales, Thor (despite his occasional romantic peccadilloes and angry outbursts) is generally seen using his superior power to protect Asgard and Midgard from the forces of chaos and disaster. For this reason, he is often seen as a morally exemplary figure possessing "unambiguously admirable qualities": a strong contrast to the more morally ambiguous Odin. He is associated with the sky, and is sometimes described as a god of thunder. Thor is the son of Odin and the giantess Jörd (Jord, the Earth). His wife is called Sif, of whom little is known, save her golden hair, which was said to be crafted for her by dwarves (after Loki shaved off her original locks). In Norse mythology, Thor owned a short-handled war hammer, called the Mjolnir, which, when thrown at a target, returned magically to the owner. His Mjolnir also had the power to throw lighting bolts. To wield the Mjölnir, Thor wears the belt Megingjord, which boosts the wearer's strength and a pair of special iron gloves to lift the hammer. These three magical items were seen as essential elements to the successful performance of his giant-killing duties. Thor travels in a chariot drawn by the goats Tanngrisnir and Tanngnjóstr (Tooth-Grinder and Tooth-Gnasher) with his servant and messenger Þjálfi and his sister Röskva. 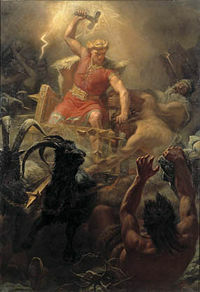 According to the Prose Edda, when Thor is hungry he can roast the goats for a meal, and when he wants to continue his travels, he needs only to touch the remains of the goats ("hallowing" them with his divine hammer) and they will be instantly restored to full health to resume their duties. Thor lives in the palace Bilskirnir (which is said to be "the greatest house" ever known) in the kingdom of Þrúðvangr. 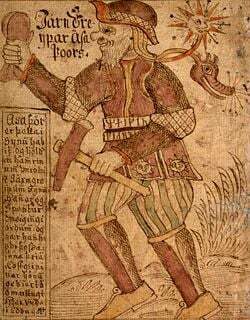 Thor carries his hammer and wears his belt of strength, eighteenth century). One legend describes Thor, disguised as a young boy, visiting the giant Hymir and offering to help him in his fishing tasks for the day. The giant, convinced that the lad would merely be a nuisance, nonetheless agreed to his companionship. When they rowed out to the ocean, the giant was content to visit his typical fishing spot. The disguised god, however, chose to continue rowing, despite the giant's warnings that they would soon enter the waters of the dreaded Midgard Serpent (Jormungandr). Thor then baited his hook with an ox's head and lowered it into the immeasurably deep water. Suddenly, the line jerked to life! Using all of his strength, the god drew the serpent up until its head broke the surface of the water. When Thor was about to kill this monstrosity, Hymir (filled with mortal terror) cut the god's line, allowing the serpent to sink back into the depths. This episode was tremendously popular, both as a topic for skaldic poetry and as subject for visual art. Despite his general role as a giant-slayer, Thor was not undefeated. In one case, Thor was outwitted by a giant king, Útgarða-Loki, who used his magical powers to outstrip the god in a variety of contests. In one, Thor was pitted in a footrace against the king's servant, Þjálfi. Though Thor lost, he was later informed that his opponent had actually been "Thought" (which is faster than any material thing). Later, Thor was challenged to a contest of strength and asked to lift up the king's cat. Though the god was only able to lift a single paw from the floor, he later found out that the "cat" had actually been the Midgard Serpent (which surrounds the entire world). Next, Thor was enticed to enter a drinking contest, which he also lost. However, he later found out that the giant king had magically connected his drinking horn to the seas - which the god had succeeded in lowering by several feet. Finally, the god was impelled to wrestle an old woman (claiming to be the king's nurse). Though he finally lost, he was told that the nurse had, in fact, been "Old Age" - who no one (human or god) will ever be able to defeat. This tale is exemplary in that it provides clear examples of the Norse understanding of Thor's potency, while simultaneously showing that he too could lose a contest. Not all tales about Thor center on his physical exploits. For example, the Alvíssmál provides an account that speaks to the intellectual (or at least crafty) side of Thor's character. In it, Thor's daughter is promised to Alvis, a dwarf. Thor, unhappy with this union, was forced to devise a plan to interfere with this unhappy arrangement (without breaking his promise). Specifically, he told Alvis that, because of his small height, he had to prove his wisdom. When Alvis agreed, Thor bade him to enter a riddling test, which he purposefully extended until after the sun had risen. As all dwarves turn to stone when exposed to sunlight, Alvis was petrified and his daughter was saved. It is said that Thor will do battle with the Midgard Serpent (a monstrous child of Loki) during the final eschatological age (Ragnarök): Thor shall put to death the Midgard serpent, and shall stride away nine paces from that spot; then shall he fall dead to the earth, because of the venom which the Snake has blown at him. After their father's death, Modi and Magni will emerge as the new bearers of the divine hammer, Mjolnir. Thor was the most popular of the Norse deities, with a large and active worship tradition spread throughout the entirety of the Scandinavian world. Indeed, when the Norse countries were slowly being converted to Christianity (from approximately 900 - 1200 C.E. ), one of the most frequent ideological contests took place between the physical and martial power of Thor and the overtly pacifistic (though salvific) power of Christ. The continued Norse veneration for their potent storm god during this transitional period is attested to in both mythic and archaeological evidence. In the first case, some surviving poetic tributes to the god are best described as hymns - texts that address the deity using second-person pronouns and expressing thanks for "defending our world against the forces of chaos." At this point I shall say a few words about the religious beliefs of the Swedes. That nation has a magnificent temple, which is called Upsala, located not far from the city of Sigtuna. In this temple, built entirely of gold, the people worship the statues of three gods. These images are arranged so that Thor, the most powerful, has his throne in the middle of the group of three. On either side of him sit Othin (Odin) and Freyr. Their provinces are as follows: “Thor,” they say, “rules the heavens; he is the god of thunder, wind and rain, fair weather and the produce of the fields. The second god, Othin, is the god of war, and he provides man with courage in the face of his enemies. The third god is Freyr, who bestows peace and pleasure upon mortals.” Indeed they depict him as having a large phallus. Othin they represent armed just as our people usually portray Mars, and Thor with his scepter seems to be the counterpart of Jupiter…. Over and above the considerable evidence for a "cult of Thor" found in the mythic and historiographic corpus, a cursory examination of archaeological discoveries from the region yields enormous evidence of the importance of the Thunder God, from runic inscriptions, to artistic depictions, to charms and amulets. Further, the occurrence of images of Thor (or his metonymic hammer) upon gravestones and burial objects suggest that the god was also seen by these peoples as the "protector and hallower of the dead." "Thor's Oak" was an ancient tree near Fritzlar in northern Hesse (Germany) and one of the most sacred of sites of the old Germans. In 723, Saint Boniface cut down the tree to demonstrate the superiority of the Christian god over Thor and the other Germanic/Nordic deities, an event that commonly marks the beginning of the Christianization of the non-Frankish Germans. Numerous location names display a historical reverence for Thor, either indigenous (Scandinavia) or imported by Germanic tribes (Scotland). However, the common English place name "Thorley" came from "Thorn-ley". "Tórshavn" (the capital of the Faroe Islands) means "Thor's harbour." "Thorsberg moor," near Süderbrarup in Anglia, Schleswig-Holstein, Germany, which, from the 1st century B.C.E. to the 4th century CE, served as the location of votive deposits by the Angles and is hence the location of important Roman Iron Age finds. "Torshov" (Norse: Þórshof, "Thor's temple"), borough in Oslo (originally an old farm) - the same name also occurs in the parishes Enebakk, Gjerdrum, Jevnaker, Lørenskog, Løten, Sigdal, Torsnes, Trøgstad and Vang. "Torsnes" (Norse: Þórsnes, "Thor's headland"), parish in the county of Østfold - the same name also occurs in the parishes Balestrand, Jondal and Vikedal. "Totland" (Norse: Þórsland, "Thor's land"), name of farms in the parishes Birkeland, Hosanger, Masfjorden, Moster, Rugsund, Samnanger, Seim and Øvre Sirdal. "Torset" (Norse: Þórssetr, "Thor's farm") farm in the parish of Fjaler. "Torstvet" (Norse: Þórsþveit, also meaning "Thor's farm") farm in the parish of Hedrum. "Torsøy" (Norse: Þórsøy, "Thor's island") district in the parish of Tjølling. "Torsåker," "Torslunda," "Torsvi," "Torshof," and "Torsharg"
The name of the god Thor is the first element in several Norwegian male names: Toralv, Torbjørn, Torfinn, Torgeir, Torgils, Torgny, Torgrim, Torkjell, Torlak, Torleif, Tormod, Torodd, Torolv, Torstein and Torvald. And also some female names: Torbjørg, Tordis, Torfrid (Turid), Torgerd, Torgunn, Torhild (Toril), Torlaug, Torunn and Torveig. It is a compound found in the Scottish Christian name Torquil, and the English surname, Thurkettle. The galaxy NGC2359 is known as Thor's Helmet. Thorium (element #90 on the periodic table) was named after the god Thor by Jöns Jakob Berzelius, the chemist who discovered it. Many polytheistic religions include deities that share one or more features with the Nordic Thor. First, many scholars note the parallels (both in terms of form and function) between Thor and other "Sky Gods" (Zeus, Jupiter, Indra and the Finnish Ukko): specifically, all are related to the skies and lightning, and are described in combat with forces of darkness or chaos. for some general comments and Unto Salo  for a discussion of these similarities in the Finnish context.</ref> Dumézil clearly delineates some of the additional commonalities shared between Thor and Indra, including "the hammer Mjollnir … [which is] like the vajra of Indra and the vazra, which the Iranian Mithra has stripped from Indra grown archdemon"; "it is the celestial weapon, the thunderbolt accompanying the 'thunder' which has furnished its name to the god." He also notes: "there are other physical traits that make him resemble Indra: red beard and a fabulous appetite." Such parallels fuel supposition that the god could have been based upon an earlier, proto-Indo-European prototype. In addition, Thor's tendency to do battle with various giants and monsters (and his frequent depictions within the mythic corpus) caused many early Roman commentators to liken him to the Greek hero, Heracles. Donner calls upon the storm clouds in this illustration by Arthur Rackham to Wagner's Das Rheingold. 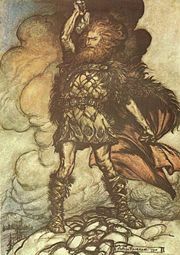 Thor, in his Germanic incarnation (Donner), appears as a central character in Richard Wagner's opera cycle, Der Ring des Nibelungen. This tremendously influential work has led to many post-Wagnerian portrayals of the deity (though some modern uses reflect more of the classic Norse understanding as well). Since Wagner's time, Thor has appeared, either as himself or as the namesake of characters, on television, in song lyrics, in comic books (especially Marvel's The Mighty Thor (1966-present)), and in literature (particularly, Douglas Adams' The Long Dark Tea-Time of the Soul). ↑ Thomas A. DuBois, Nordic Religions in the Viking Age. (Philadelphia: University of Pennsylvania Press, 1999), 57. ↑ Additionally, Thursday is rendered Torstai in Finnish, and Torsdag in Swedish, Danish, and Norwegian. ↑ John Lindow. Handbook of Norse mythology. (Santa Barbara, CA: ABC-CLIO, 2001), 6-8. Though some scholars have argued against the homogenizing effect of grouping these various traditions together under the rubric of “Norse Mythology,” the profoundly exploratory/nomadic nature of Viking society tends to overrule such objections. As Thomas DuBois cogently argues, “[w]hatever else we may say about the various peoples of the North during the Viking Age, then, we cannot claim that they were isolated from or ignorant of their neighbors…. As religion expresses the concerns and experiences of its human adherents, so it changes continually in response to cultural, economic, and environmental factors. Ideas and ideals passed between communities with frequency and regularity, leading to and interdependent and intercultural region with broad commonalities of religion and worldview.” (27-28). ↑ See Georges Dumézil. Gods of the Ancient Northmen. Edited by Einar Haugen; Introduction by C. Scott Littleton and Udo Strutynski. (Berkeley: University of California Press, 1973), xi-xiii, 3-25. ↑ Gabriel Turville-Petre. Myth and Religion of the North: The Religion of Ancient Scandinavia. (New York: Holt, Rinehart and Winston, 1964), 81. ↑ Snorri Sturluson, The Prose Edda: Tales from Norse Mythology, translated by Brodeur, Introduced by Sigurdur Nordal,Gylfaginning (XXI), (Dover Value Editions) Berkeley, CA: University of California Press, 1954), 35). ↑ Ibid., Gylfaginning (XXI), 35); See also (Brodeur, XLIV), 56-58. ↑ Ibid., (Brodeur (XXI), 35). ↑ Described in Lindow, 288. ↑ Turville-Petre, 85. It should be noted that such "hymns" are virtually unheard of in the Norse context and are only rarely seen in conjunction with other deities (with the possible exceptions being Odin and Freyr). ↑ Adam of Bremen, Gesta Hammaburgensis Ecclesiae Pontificum, 1070. Translated from the Latin by the Northvegr Foundation and accessed online at: .Retrieved November 13, 2007. ↑ DuBois, 150, 158-159. An intriguing element of DuBois's treatment of these artifacts is his examination of the similar symbologies used by devotees of Thor and the early Scandinavian Christians. ↑ See Wikipedia for the most up-to-date (though perhaps not the most inclusive) listing of Thor's appearances in popular culture. Salo, Unto. "Ukko, the Finnish God of Thunder: Separating Pagan Roots from Christian Accretions" (Part One). Mankind Quarterly 46(2) (Winter 2005): 165-245. Sturluson, Snorri. The Prose Edda, Translated from the Icelandic and with an introduction by Arthur Gilchrist Brodeur. New York: American-Scandinavian Foundation, (original 1916). This page was last modified on 7 December 2015, at 22:46.